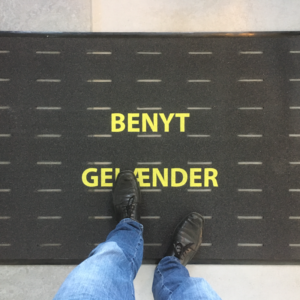 Our safety mats are available with both text and pictograms, which can have an additional safety optimization effect. We have both ergonomic and anti-slip mats, and of course we also have mats that are both. What safety mat you need depends on where you want to place it and what effect you expect from the mat. We always recommend investing in ergonomic safety mats that ensure high comfort for those areas where work is done for long periods of time. Many of our safety mats are extremely resistant and durable, and they can easily be placed in harsh environments where they are exposed to a lot of wear, without ripping or breaking. Where should you put safety mats? 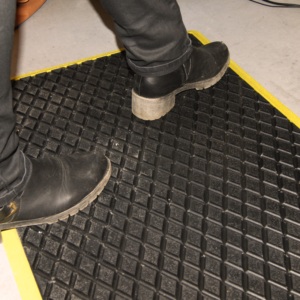 We see quite often that people are unsure about where they should have safety mats. One should always acquire security mats for areas where a lot of work is done as the mats not only enhance safety, but also provide more comfort for the people working on them. In addition, you should of course also acquire safety mats for areas where there is a risk of falling and there is no other obvious solution to this problem than safety mats. You can benefit from checking out our other anti-slip solutions if you are in doubt as to whether another safety optimization solution is preferable to one or more safety mat(s). If we are to identify which areas may be advantageous to equip with one or more safety mats, then it would be in the following locations: at the machines, at doors and entrances, at the packing tables, at receptions and in hallways. There are many good reasons to make sure that safety is at the top of one's business. Falling and slipping accidents at work can indeed be costly affairs, both financially and mentally. If an accident occurs due to a lack of safety, it is not nice to have to live with the fact that the accident could have been avoided if more resources had been used for safety optimization. Therefore, you should always optimize your business so that your employees feel safe and secure. It is also very likely that your employees will appreciate it if you make a great and active effort to optimize workplace safety. There are many ways to optimize safety. Just take a look at our website and you will soon find that we offer many different safety optimization solutions. We have many years of industry experience, so our knowledge of safety optimization has gradually become enormous. We have experience in safety optimizing many different environments, for example, we have previously provided security optimization solutions for offshore, industrial and marine environments. Would you like our help to make your workplace even safer, so please feel free to contact us either by phone or mail. We can be reached on +45 26 11 44 66. If you wish to send us an email, send it to realsap@realsap.com.